Volume 1 | Issue 1 | Apr – June 2016 | Page 5-9|Bassel G Diebo, Jeffrey J Varghese BS, Frank J Schwab. Authors :Bassel G Diebo, Jeffrey J Varghese BS, Frank J Schwab. Spine Service, Hospital for Special Surgery, New York, NY, United States. Respect for the sagittal plane has been broadly published and accessible for all surgeons. Yet, suboptimal outcomes and revision cases remain highly prevalent. In this article, the authors present a case of a pleasant lady who started with a simple lumbar decompression surgery for spinal stenosis that deteriorated and then failed revision surgery, ultimately presenting with a severely disabling flatback and a remarkable spinal deformity. Her case highlights the importance of sagittal alignment in degenerative patients. Failure to appreciate the sagittal plane has a direct impact on patient reported outcomes and serious debilitating iatrogenic deformity. The maintenance of spinal alignment is not a deformity specific exercise; therefore, all surgeons should consider optimizing the sagittal plane to reduce the incidence of not only iatrogenic deformity but the burden of any spinal pathology. Keywords: Sagittal Malalignment, adult spinal deformity, degenerative scoliosis. The close relationship between sagittal spinal alignment and patient reported outcomes is widely recognized [1–8]. As a result, sagittal radiographic parameters, such as the SRS-Schwab modifiers (Sagittal vertical axis: SVA, pelvic incidence minus lumber lordosis: PI-LL, and pelvic tilt: PT), have been investigated and validated in multiple spinal pathologies and patient groups. However, to date, iatrogenic causes remain an important contributor to the prevalence of adult spinal deformity. One reason for the increased incidence of iatrogenic deformity relates to the lack of correction and/or preservation of sagittal alignment when addressing focal or regional degenerative conditions. In addition to decompression and stabilization, maintenance of lumbar lordosis is crucial in avoiding the creation of deformities such as flatback syndrome . The importance of the sagittal plane was originally established based on multi-center databases of spinal deformity patients; however, recent studies on patients undergoing less invasive procedures for lumbar degenerative conditions unraveled the universality of this importance. 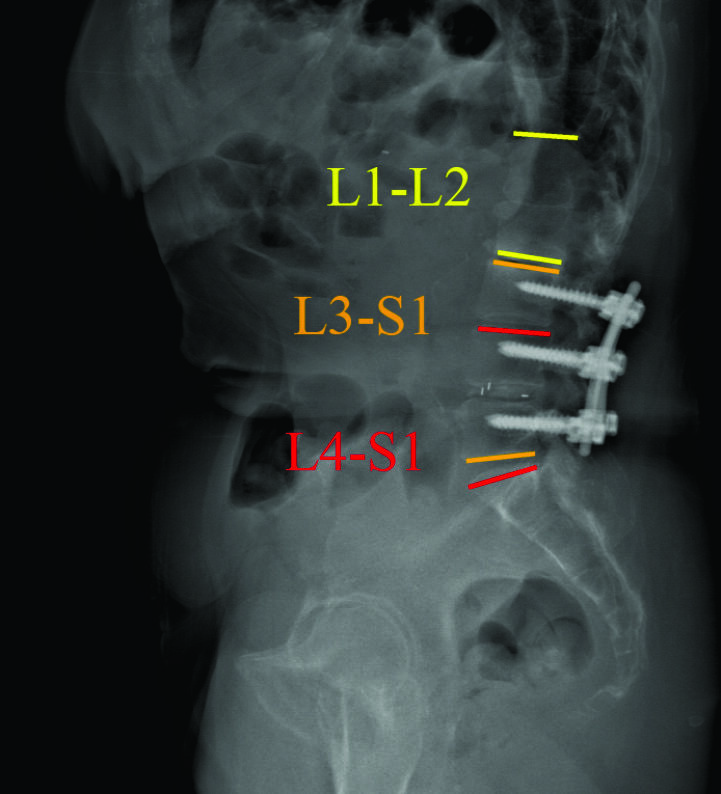 In a literature review of the last two decades, Mehta et al concluded that the sagittal parameters play a central role in the treatment of isthmic spondylolysis, spondylolisthesis, and degenerative pathologies . Masevnin and Kumar et al have both demonstrated that adjacent segment pathologies are more prevalent in patients who underwent surgical correction of degenerative conditions without correcting sagittal alignment [11,12]. Finally, hypo- and hyperlordosis have been reported as risk factors for disc height reduction and facet joints arthritis, respectively [13,14]. Respect for the sagittal plane has been broadly published and accessible for all surgeons. Yet, suboptimal outcomes and revision cases remain highly prevalent [15–19]. In this article, the authors present a case of a pleasant lady who started with a simple lumbar decompression surgery and a subsequent failed revision surgery. Following a short fusion of L3-L5, the patient presented herself to the spine clinic of the senior author with a disabling flatback, an inability to walk more than 1 block, and a remarkable adult spinal deformity. This is a 70-year old Caucasian female who recently presented to the senior author’s clinic with a long history of back pain and two previous surgeries. In 2011, she had lumbar laminectomies and decompressions (L3-L5) and in 2012 she ultimately underwent a L3 to L5 instrumented fusion. Her severe (8/10) pain returned in 2013, originating in her buttock region, and traveled inferiorly through the right leg to the foot. For two years, the patient was only able to walk one block before she had to pitch forward from significant back pain and need external support. She underwent several non-operative treatments including: epidural injections, physical therapy, acupuncture, massages, and multiple nerve blocks. She is on Tramadol three times a day and one Percocet 5/325 every night. The patient stood with both sagittal and coronal malalignments (Fig. 1), was unable to toe or heel walk, and had poor tandem gait. She demonstrated right distal extremity numbness and weaknesses of both the tibialis anterior and extensor hallucis longus, but was otherwise neurovascularly intact. CT scan:T12-Sacrum axial imaging revealed a mild degenerative scoliosis of the upper lumbar spine with the apex between L2-L3. Cephalad to the L3-L5 fusion, the patient had facet arthroses, a disc bulge, and central canal stenoses at T12-L1 and L1-L2. At the fusion levels, the patient had multiple degenerative discs, facet arthroses, and neural foraminal narrowings. X-Ray analysis: The patient presented with a pelvic incidence of 57°, indicating a standard pelvic morphology from a spinal perspective. Sagittal alignment analysis revealed a severe adult spinal deformity classified by the SRS-Schwab: PI-LL mismatch of 34° (++), PT of 40° (++) and SVA of 86 mm (++). Thorough analysis of the lumbar spine demonstrated a caudal (L4-S1) lordosis of 24°, L3-L5 (fused segments) lordosis of 18° and, L1-L2 (unfused segments) kyphosis of 6° (Fig. 2). The thoracic spine did not exhibit any hypokyphotic compensation (TK = 45°). Coronal x-rays revealed a 22° coronal curve (L1-L3) and a 65 mm right coronal malalignment. The full radiographic analysis is reported in Fig. 3. After discussing the treatment options, benefits, and risks, with the patient for her severe sagittal plane deformity, the decision was made to extend the fusion to T3 with pelvic fixation. The surgical strategy included a L3 pedicle subtraction osteotomy (PSO) of 35° and a L5-S1 transpedicular lumbar interbody fusion (TLIF) for an expected 10° of lordotic correction. Using dedicated software (Surgimap, Nemaris Inc, New York, NY), the surgical plan was simulated to ensure proper post-operative alignment. Patient-specific custom rods were generated and forwarded to the manufacturer to be pre-bent, ensuring an accurate execution of the surgical plan. In the OR, the reconstruction required additional T3-L2 Smith-Peterson osteotomies to afford fusion and deformity correction. At the osteotomy site, a wide laminar foraminotomy from L2 to L4 was performed and two short rods were added between these levels (Four-Rod technique), offering adequate correction and closure. Fluoroscopy confirmed that the proper correction was achieved in both planes. In degenerative spondylolisthesis (DS), it is now established that higher pelvic incidences result in higher sacral slopes and shear stresses at the lumbosacral junction, making it a predisposing factor for DS. Moreover, Jeon et al took this a step further to conclude that degenerative retrolisthesis exists in two types, both of which are driven by sagittal parameters; one primarily resulting from degeneration in patients with low pelvic incidences, and the other secondarily resulting from compensatory mechanisms in patients with anterolistheses and high pelvic incidences . Ultimately, sagittal alignment influences two out of the three features included in the Labelle classification of spondylolisthesis . With regards to surgical treatment, Feng et al showed that the restoration of pelvic tilt and lumbar lordosis played important roles in the surgical outcomes of DS . In other degenerative diseases, Bae et al demonstrated that patients with an upper lumbar disc herniation have significantly different sagittal profiles than patients with a lower disc herniation. In their studies, pelvic incidence and lumbar lordosis were significantly factors in determining the level of disc herniation [23)]. Thus, treatment of these pathologies is increasingly considering the sagittal plane. Patients with lumbar stenosis adopt a forward compensatory bending posture to relieve the symptoms of neural compression [25,26].This malalignment pattern may be confused with sagittal spinal deformity and a loss of lumbar lordosis. Thus, there has been a recent debate on whether a surgeon should address the stenosis by decompression+/-fusion alone or with spinal realignment as well. Recent data demonstrated that decompression alone does indeed improve the sagittal profile of spinal stenosis patients. Jeon et al investigated 40 lumbar stenosis patients and followed them up to two years. In their study, patients who underwent decompressions alone had improvements in SVA, from 39 mm at baseline to 23 mm at 2 year follow up . Buckland et al, in unpublished data, showed that while anterior truncal malalignment was similar between deformity and degenerative patients, pelvic tilt appeared to be a unique compensatory mechanism of deformity patients. Recently, Fujii et al showed that decompressions can improve global alignment in stenotic patients when malalignment is induced by a compensatory reduction in lumbar lordosis . However, they also noticed that without corrective surgery, stenosis patients with higher preoperative malalignments (PI-LL > 21.5 and SVA > 69 mm) had residual malalignments postoperatively. 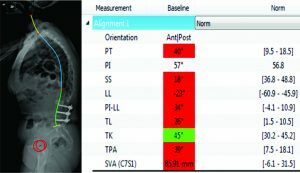 This malalignment has proven to negatively impact patients reported outcomes in another study by Hikata et al [28)] In general, there is rising consensus that lumbar stenosis patients with severe sagittal malalignment (SRS Schwab SVA ++) should be assessed for a concomitant sagittal deformity and ultimately be considered for corrective surgery. While more research is needed to establish treatment guidelines for sagittal realignment of spinal stenosis patients, it is crucial to understand that the maintenance of sagittal alignment is a must. The patient in this article deteriorated from being a spinal stenosis patient undergoing a two-level fusion to a flatback patient requiring realignment with osteotomy. This iatrogenic deformity is challenging and is commonly seen in daily practice of deformity surgeons. Based on the PI-LL formula, our patient needed approximately 50° of L1-S1 lordosis, of which 65% (32°) should be in the extreme caudal lumbar segments [29)]. However, when looking at the L1-S1 lordosis of this patient, she only had 21°. More importantly, the previously fused caudal segments were constructed with only 18°, which is a clear loss of lordosis. Sagittal alignment: How to improve, What is new and How to be more patient-specific? To improve our understanding of the sagittal plane, the gap between researchers and clinicians must be bridged. Feedback from surgeons in daily practice is crucial to improve the current guidelines of sagittal realignment. The ultimate goal is a personalized treatment that addresses the patient’s age, pathology, function, expectations, and spino-pelvic morphology. Lafage et al investigated the impact of age on the spino-pelvic alignment and provided updated thresholds of PT, PI-LL and SVA . The new targets for the radiographic parameters provide more “patient-specific” alignment thresholds. 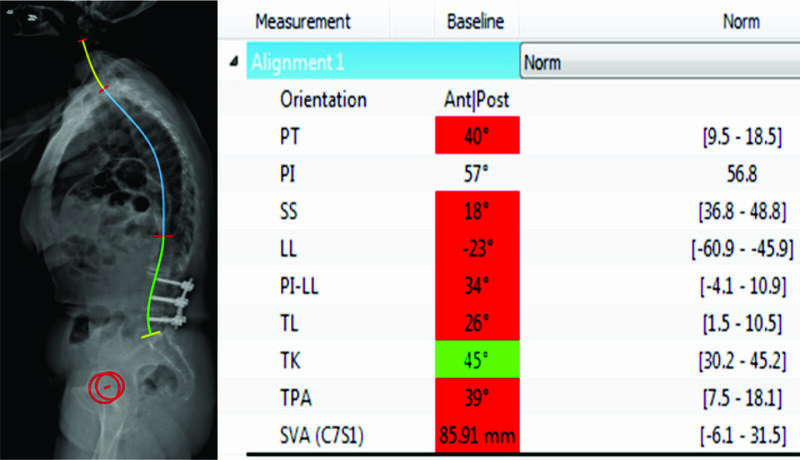 Their data revealed that age should be considered when determining the ideal sagittal alignment for a given patient, with older patients requiring less rigorous alignment objectives (Table 1). Table 1: Age-adjusted sagittal alignment thresholds. Moreover, patient-specific instrumentation is a recent advancement in spine surgery. Surgeons can now plan their surgery and choose or construct certain instrumentations based on their patient’s morphology and alignment targets. Using the existing knowledge on the optimal sagittal alignment, these customized implants might help preserve the sagittal plane in degenerative patients. There are several factors that need to be acknowledged to achieve or maintain adequate sagittal alignment of the spine. The pelvis is a key component that must be considered. The measurement of pelvic incidence (PI) and the calculation of the mismatch between PI and lumbar lordosis are crucial in assessing the deformity magnitude when its main driver is the loss of LL. 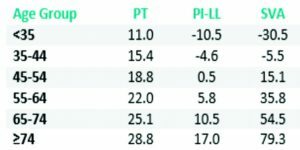 Any mismatch > 10° is associated with worse patient reported outcomes. Every surgeon needs to ensure that the surgical intervention does not alter this harmony between the spine and the pelvis [1,4]. Moreover, analysis of the compensatory mechanisms recruited by each patient is mandatory. Pelvic tilt, thoracic hypokyphosis, and knee flexion  are common mechanisms that need to be considered and delineated from the main driver of deformity. The surgery needs to be planned with the help of dedicated software and the plan needs to be simulated to confirm that post-operative alignment is ideal [32,33]. Finally, patient expectations, comorbidities, and their soft tissue profile are highly important aspects to consider. These are being investigated for their impact on how we treat our spinal pathology patients. This article, drawing support from cases and the plethora of literature available, highlights the importance of sagittal alignment in degenerative patients. Failure to appreciate the sagittal plane has a direct impact on patient reported outcomes and serious debilitating iatrogenic deformity. The maintenance of spinal alignment is not a deformity specific exercise; therefore, all surgeons should consider optimizing the sagittal plane to reduce the incidence of not only iatrogenic deformity but the burden of any spinal pathology. 1. Schwab F, Patel A, Ungar B, Farcy J, Lafage V. Adult spinal deformity-postoperative standing imbalance: how much can you tolerate? An overview of key parameters in assessing alignment and planning corrective surgery. Spine (Phila Pa 1976). 2010 Dec;35(25):2224–31. 2. Schwab FJ, Lafage V, Farcy J-P, Bridwell KH, Glassman SD, Ondra S, et al. 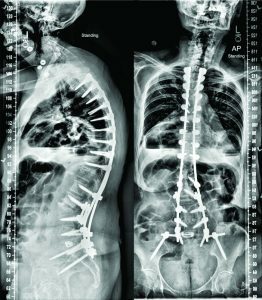 Surgical rates and operative outcome analysis in thoracolumbar and lumbar major adult scoliosis: application of the new adult deformity classification. Spine (Phila Pa 1976) [Internet]. 2007 Nov 15;32(24):2723–30. 3. Youssef J a, Orndorff DO, Patty C a, Scott M a, Price HL, Hamlin LF, et al. Current Status of Adult Spinal Deformity. Glob spine J [Internet]. 2013 Mar;3(1):51–62. 4. Schwab FJ, Ungar B, Blondel B, Buchowski J, Coe J, Deinlein D, et al. Scoliosis Research Society-Schwab adult spinal deformity classification: a validation study. Spine (Phila Pa 1976) [Internet]. 2012 May 20 [cited 2013 Aug 12];37(12):1077–82. 5. Terran J, Schwab F, Shaffrey CI, Smith JS, Devos P, Ames CP, et al. The SRS-schwab adult spinal deformity classification: Assessment and clinical correlations based on a prospective operative and nonoperative cohort. Neurosurgery. 2013 Jul;73(4):559–68. 6. Sengupta DK. Re: Schwab F, Ungar B, Blondel B, et al. 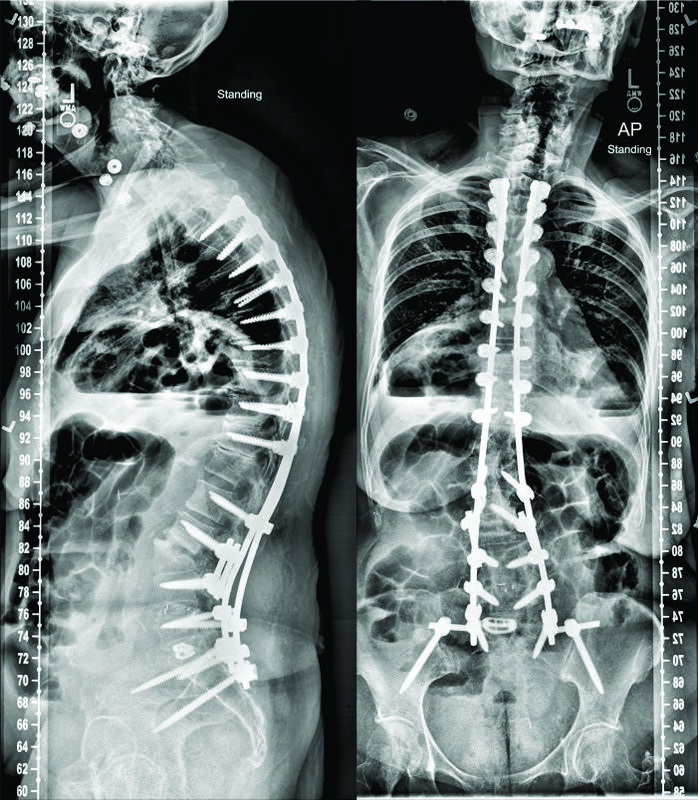 Scoliosis research society—Schwab adult spinal deformity classification–-a validation study. Spine 2012; 37:1077—82. Spine (Phila Pa 1976) [Internet]. 2012 Sep 15 [cited 2014 Mar 24];37(20):1790. 7. Smith JS, Klineberg E, Schwab F, Shaffrey CI, Moal B, Ames CP, et al. Change in Classification Grade by the SRS-Schwab Adult Spinal Deformity Classification Predicts Impact on Health-Related Quality of Life Measures: Prospective Analysis of Operative and Non-operative Treatment. Spine (Phila Pa 1976). 2013;38:1663–71. 9. Farcy J-P, Schwab FJ. Management of flatback and related kyphotic decompensation syndromes. Spine (Phila Pa 1976) [Internet]. 1997 Oct;22(20):2452–7. 10. Mehta V a., Amin A, Omeis I, Gokaslan ZL, Gottfried ON. Implications of spinopelvic alignment for the spine surgeon. Neurosurgery [Internet]. 2011 Mar [cited 2014 Nov 18];70(3):707–21. 11. Masevnin S, Ptashnikov D, Michaylov D, Meng H, Smekalenkov O, Zaborovskii N. Risk factors for adjacent segment disease development after lumbar fusion. Asian Spine J [Internet]. 2015 Apr;9(2):239–44. 12. Kumar M, Baklanov A, Chopin D. Correlation between sagittal plane changes and adjacent segment degeneration following lumbar spine fusion. Eur Spine J [Internet]. 2001 Aug 1 [cited 2014 Nov 18];10(4):314–9. 13. Inoue G, Takaso M, Miyagi M, Kamoda H, Ishikawa T, Nakazawa T, et al. 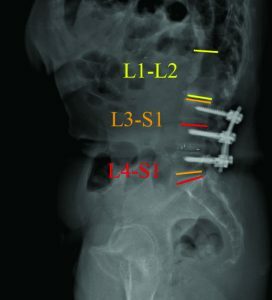 Risk Factors for L5-S1 Disk Height Reduction after Lumbar Posterolateral Floating Fusion Surgery. J Spinal Disord Tech [Internet]. 2014;27(5):187–92. 16. Maier SP, Lafage V, Smith JS, Obeid I, Mundis GM, Klineberg EO, et al. Revision Surgery After Three-Column Osteotomy (3CO) in 335 Adult Spinal Deformity (ASD) Patients: Intercenter Variability and Risk Factors. Spine J [Internet]. 2013 Sep [cited 2013 Dec 5];13(9):S9–10. 17. Sansur C a, Reames DL, Smith JS, Hamilton DK, Berven SH, Broadstone P a, et al. Morbidity and mortality in the surgical treatment of 10,242 adults with spondylolisthesis. J Neurosurg Spine [Internet]. 2010 Nov [cited 2014 Jun 10];13(5):589–93. 18. Diebo BG, Henry J, Lafage V, Berjano P. Sagittal deformities of the spine: factors influencing the outcomes and complications. Eur Spine J [Internet]. 2015 Jan [cited 2015 Mar 10];24 Suppl 1:3–15. 20. Jeon CH, Park JU, Chung NS, Son KH, Lee YS, Kim JJ. Degenerative retrolisthesis: Is it a compensatory mechanism for sagittal imbalance? Bone Jt J. 2013;95 B(9):1244–9. 21. Labelle H, Mac-Thiong J-M, Roussouly P. Spino-pelvic sagittal balance of spondylolisthesis: a review and classification. Eur Spine J [Internet]. 2011 Sep [cited 2013 Oct 7];20 Suppl 5:641–6. 22. Feng Y, Chen L, Gu Y, Zhang Z-M, Yang H-L, Tang T-S. Influence of the posterior lumbar interbody fusion on the sagittal spino-pelvic parameters in isthmic L5-s1 spondylolisthesis. J Spinal Disord Tech [Internet]. Elsevier Inc; 2014;27(1):E20–5. 24. Jeon C-H, Lee H-D, Lee Y-S, Seo H-S, Chung N-S. Change in Sagittal Profiles After Decompressive Laminectomy in Patients With Lumbar Spinal Canal Stenosis. Spine (Phila Pa 1976) [Internet]. 2015;40(5):E279–85. 25. Lim JK, Kim SM. Comparison of Sagittal Spinopelvic Alignment between Lumbar Degenerative Spondylolisthesis and Degenerative Spinal Stenosis. J Korean Neurosurg Soc [Internet]. 2014 Jun;55(6):331–6. 26. Suzuki H, Endo K, Kobayashi H, Tanaka H, Yamamoto K. Total sagittal spinal alignment in patients with lumbar canal stenosis accompanied by intermittent claudication. Spine (Phila Pa 1976) [Internet]. 2010 Apr 20;35(9):E344–6. 27. Fujii K, Kawamura N, Ikegami M, Niitsuma G, Kunogi J. Radiological Improvements in Global Sagittal Alignment after Lumbar Decompression without Fusion. Spine (Phila Pa 1976) [Internet]. 2015;40:703–9. 28. Hikata T, Watanabe K, Fujita N, Iwanami A, Hosogane N, Ishii K, et al. Impact of sagittal spinopelvic alignment on clinical outcomes after decompression surgery for lumbar spinal canal stenosis without coronal imbalance. J Neurosurg Spine [Internet]. 2015;23(4):451–8. 29. Been E, Barash A, Marom A, Kramer P a. Vertebral bodies or discs: which contributes more to human-like lumbar lordosis? Clin Orthop Relat Res [Internet]. 2010 Jul [cited 2014 Sep 22];468(7):1822–9. 30. Lafage R, Schwab F, Challier V, Henry JK, Gum J, Smith J, et al. Defining Spino-Pelvic Alignment Thresholds: Should Operative Goals in Adult Spinal Deformity Surgery Account for Age? Spine (Phila Pa 1976) [Internet]. 2016 Jan;41(1):62–8. 31. Diebo BG, Ferrero E, Lafage R, Challier V, Liabaud B, Liu S, et al. Recruitment of compensatory mechanisms in sagittal spinal malalignment is age and regional deformity dependent: a full-standing axis analysis of key radiographical parameters. Spine (Phila Pa 1976) [Internet]. 2015 Feb;40(9):642–9. 32. Akbar M, Terran J, Ames CP, Lafage V, Schwab FJ. Use of Surgimap Spine in Sagittal Plane Analysis, Osteotomy Planning, and Correction Calculation. Neurosurg Clin N Am [Internet]. 2013/04/09 ed. Elsevier Inc; 2013 Apr [cited 2013 Aug 12];24(2):163–72. How to Cite this Article:Diebo BG, Varghese JJ, Schwab FJ. Factors Influencing Sagittal Malalignment and its effect on Clinical Implications in Adult Spinal Deformity. 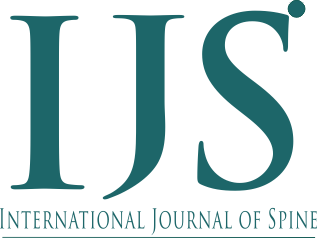 International Journal of Spine Apr – June 2016;1(1):5-9.